Mozart is a gorgeous orange tabby DLH boy. He was born on 9/4/18. 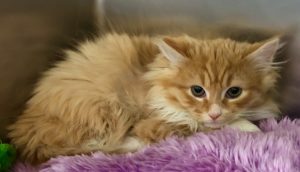 Mozart made his way to Last Hope from the Town of Brookhaven Animal Shelter. He’s currently soaking up attention from our volunteers, and giving back love and purrs. Soon he will be ready for his forever home. Mozart is waiting to make beautiful music with you. Come meet him!